The works reveal the constant tension between the material and immaterial condition of art. 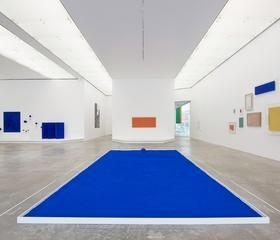 Klein believed that the new art would arise in the construction of fields of sensibility, whether through the purity of Klein blue, through the experience of the void—as developed in his iconic pieces Leap into the Void, together with the newspaper documenting the event,Dimanche (1960)—or the paintings created with fire and air, as well as by reflecting on the value of the artwork. For Klein, art can only take place in space, and therefore as experience. Hence, in his Anthropometries, one of his best-known series, Klein executes the painterly act as a bodily, carnal action, though not that of the artist but rather of the bodies of models, covered in paint and used to leave an imprint on the canvas. When Klein produced the Anthropometry of the Blue Period (1960) he did so before a live audience, accompanied by models while musicians played the score to his Monotone-Silence Symphony (1949), a piece comprising a single note followed by a period of silence.